I absolutely love it when a new artist joins Nail Magazine's Nail Art Gallery - especially if you're good... or amazing like DessiNails is. Her full name is Desislava Draganova and she's Bulgarian, but lives in Greece. 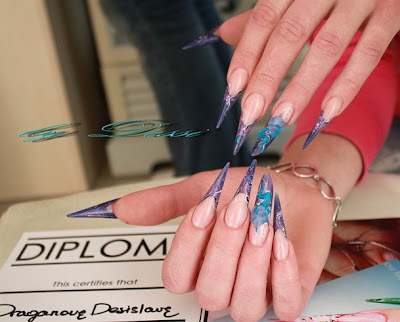 She went to school for hair and nails beginning in 2004 and decided that nails were just more exciting than doing hair. She loves doing L&P (liquid and polymer aka acrylics) and her favorite products to use are Entity, Nail Artists, and Magnetic. At the beginning of this month she competed in a BG french competition and took 2nd place - congratulations! She did this without any real competition training, so thats a huge accomplishment! She also said that since gel polishes have come out, her clients forgot what regular nail polish is! So she's a huge fan of Shellac, Gelish, Entity One Color, and IBD. If you want to see more of her work please visit her Facebook, Nail Art Gallery, or Blog. Just a heads up that the blog is new - but she'll be adding to it soon! :) I'm a huge fan of her work, so I know I can't wait to see more! Wish I had known she was in Athens, Greece when I was there last year! I would have had my nails done! :) Maybe next time?